When submitting a bug report, please use the below template and thoroughly fill out the necessary information. To obtain the system information, open the FFXIV launcher and select Config → System Information → Display. I have been having almost the same issue for the past week. I am able to login to the game and get to character select, but when I click on my character and get to the loading screen a similar error pops up and after I click OK the game crashes. 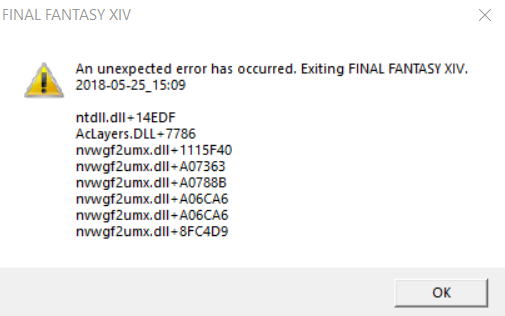 Sometimes no error pop-up comes up and the game crashes immediately. Before posting here I opened a ticket with SE Support and they asked me to attempt lowering graphics settings, updating my graphics card driver, and reverting to Direct X 9 client. The issue persists with all of these attempted fixes. This issue started while I was trying to unlock the Ridorana Lighthouse (see my character location). I believe I was still on the Prima Vista when my game first crashed, possibly while loading into the Lighthouse zone. Thank you for your patience while your concern was being investigated by the development team, and we apologize for any inconvenience this has caused you. Unfortunately, after investigating your concern, the issue could not be replicated. The development team has recommended that you try reinstalling the game to resolve your difficulties with logging into the game. If you continue to experience login issues after reinstalling the game, please submit a new report, and we will make sure to escalate your concern for further review. Thank you again for your patience and understanding!